There has been a boom of hamburger restaurants in the last few years. There are hundreds of restaurants where you can choose from, some are better than others and many can say a burger is a burger everywhere you go. Well last week I was craving a big delicious hamburger and I wanted to try someplace different. I was in La Condesa, a trendy neighborhood in Mexico City full of bars and restaurants. I wanted to go somewhere near and I had heard of a restaurant called Kitchen 6. I goggled the place and decided it was time to try it. 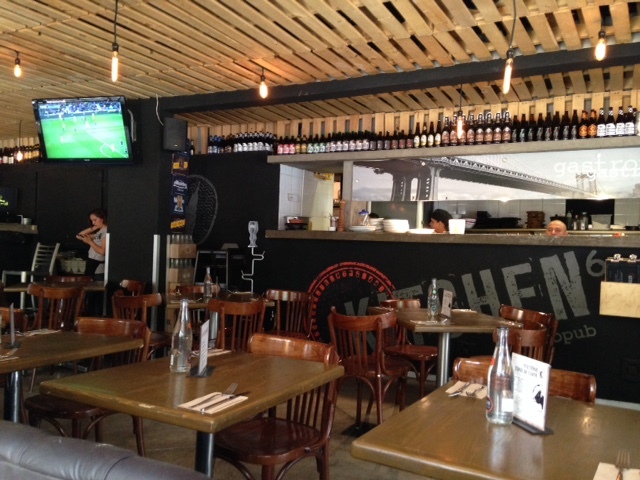 Kitchen 6 is a gastropub which means it serves high-end beer and food. This restaurant is unique in Mexico City since there are not many places with this concept. The place is casual, you have outdoor seating which is very enjoyable on sunny days. There is a bar with around 50 different beers to enjoy with your meal. The menu includes beer recommendations with every dish which in my opinion is a unique touch. The beer menu as you can imagine is diverse and suits all kinds of tastes. The specialty are the burgers although they do offer other things. As starter we got the edamames with chili, I love everything related with spicy food so I enjoyed these edamames very much. For the main plate you have several options of burgers, I went for the one with beer. The beef patty has the form of a ball and has melted cheese in it, its then injected with some beer which enhances the overall flavor. 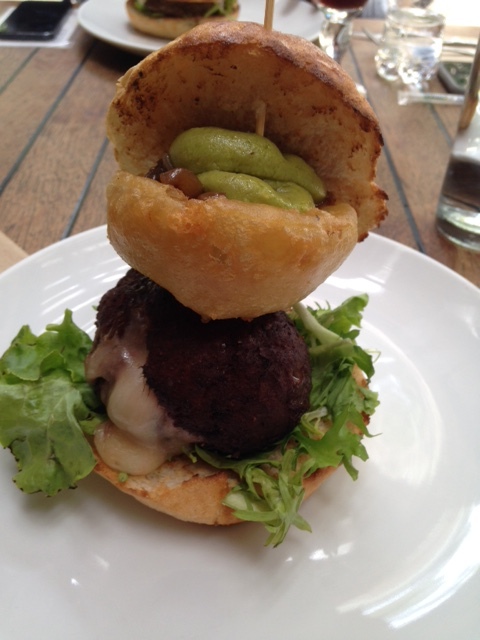 The burgers are also served with an onion ring inside so the size is very big. I couldn’t eat the burger without tearing it apart but it was absolutely delicious! The first bite the melted cheese comes out and the flavors mix in creating an amazing gastronomical experience. We also got the regular french fries which come with 6 different sauces from mustard to mayonnaise and chipotle making it a great side dish. If you like to experience unique dishes and love burgers this is a must in Mexico City!